Antonello da Messina (c 1430–1479), Christ at the Column (detail) (c 1476), oil on panel, 30 x 21 cm, Musée du Louvre, Paris. Wikimedia Commons. By the middle of the 1400s, oil painting had been used for artistic works in northern Europe for over 200 years, and in the workshops of the van Eycks and their contemporaries it had flourished in ways simply not possible with other media such as egg tempera and fresco. But in Italy, with the southern Renaissance well under way, drying oils were still not used as a primary painting medium. 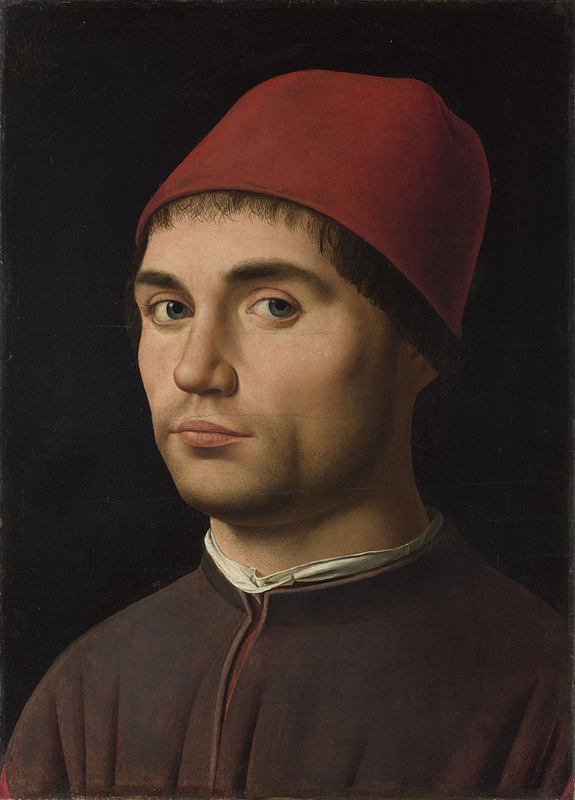 By 1500, Italian painters had not just caught up with developments in the north, but were – in some respects at least – in the lead in technical development. This article considers how that happened. If Vasari’s 1568 account of the history of art, The Lives of the Artists, was less than reliable on the origins of oil painting and the role of the van Eycks, it should surely be more trustworthy when it comes to more recent events in Italy, and the history of oil painting there. According to Vasari, impressed by a painting by Jan van Eyck which had been brought to Italy, Antonello da Messina travelled to Bruges and there learned to paint in oils from van Eyck himself. After van Eyck’s death, Antonello returned to Italy, and painted for many years in Venice, where his oil paintings were greatly successful. Among the great works in oils by Antonello which Vasari singles out for praise was one for the church of San Cassiano, in Venice. Vasari thus attributes to Antonello the role of bringing painting in oils from van Eyck’s workshop to Italy. Subsequent research into the lives of Jan van Eyck and Antonello da Messina (actually Antonello d’Antonio) have raised some fundamental problems with this alluringly simple story. First, van Eyck and Antonello’s lives overlapped very little, insufficient for them to have met: Jan van Eyck is well attested to have died on 9 July 1441, and Antonello was almost certainly born between 1429 and 1431. Antonello probably trained in Naples between about 1450 and 1455, returning to Sicily by 1457, although soon afterwards he left and did not return until 1460. He was probably away from Messina again between 1465 and 1471, only to go to Venice in late 1474. 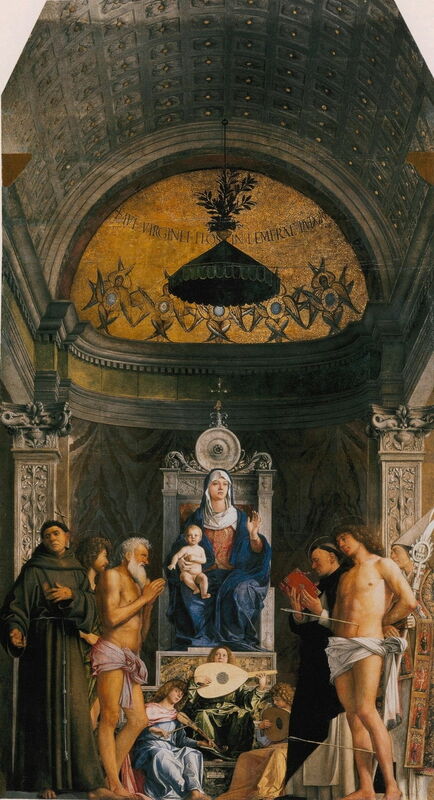 Antonello did paint the San Cassiano altarpiece, in 1476, but later that year was back in Messina. He died suddenly in 1479. So, if Antonello did not learn to paint in oils in van Eyck’s workshop, where did he? The answer is a bit more complex, in that Antonello was probably a pupil of Niccolò Colantonio (c 1420-1460) in Naples, and was in contact again with northern European techniques when he was in Venice in the 1470s. Colantonio seems to have learned oil painting from Flemish artists who were brought to the court of Alfonso V of Aragon, who was King of Naples from 1442-1458, and an enthusiast for northern European paintings. 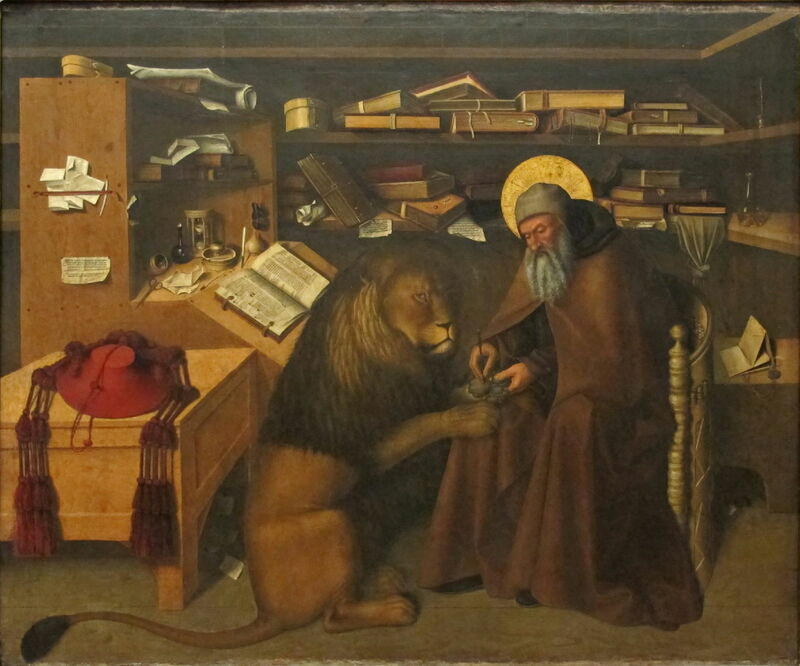 Niccolò Antonio Colantonio (c 1420-1460), Saint Jerome in His Study (c 1445), oil on panel, 151 × 178 cm, Museo di Capodimonte, Naples. Photo by Sailko, via Wikimedia Commons. 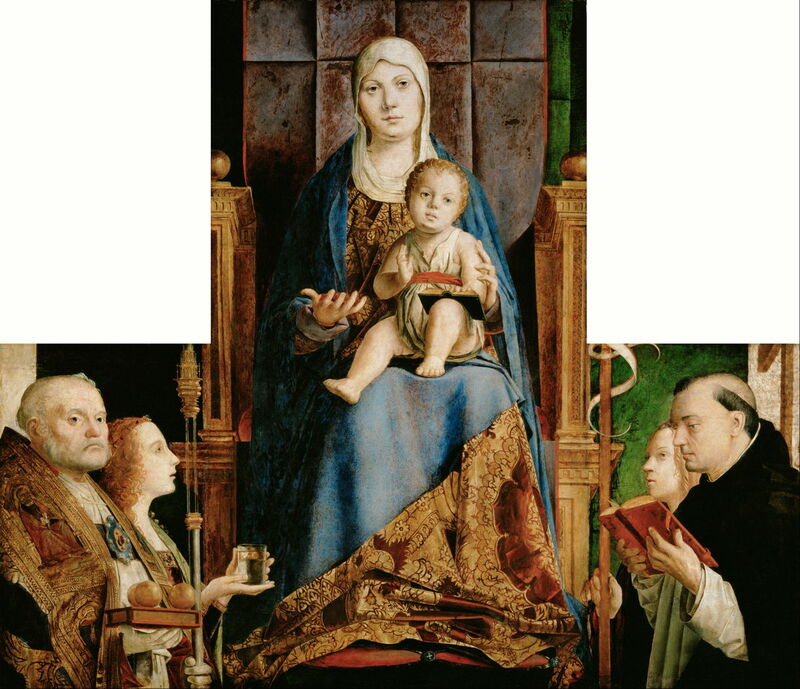 Colantonio also painted in oils himself, and had clearly come under Flemish influence. As early as 1445, he painted Saint Jerome in His Study, an unusual hybrid of styles with a distinctively northern motif, using oils as his primary medium. By the time of his death in 1460, Colantonio doesn’t appear to have painted anything revelatory or revolutionary, but accomplished much in his teaching. Piecing together Antonello’s accomplishment is even harder. His workshop in Messina, Sicily, worked by painting copies and variations of the originals which he created (common practice in Italy at that time). With three recognisable painters (Antonio and Pietro de Saliba, and Salvo d’Antonio) plus Antonello himself, it is extremely difficult to know which version of any given painting believed to have come from the workshop was actually the master’s. To ensure that I err on the exclusive side, I therefore only show paintings which Skorupa firmly believes to be Antonello’s, which excludes several which are more generally accepted as being his. There are also considerable difficulties in dating Antonello’s paintings. With one exception, those that I show here are normally dated within the last five years of his life, when he was working in Venice, possibly Milan, and Messina. Looking at these paintings, I beg to differ on their order and dating. Antonello da Messina (c 1430–1479), Saint Sebastian (c 1478-9), oil on wood panel transferred to canvas, 171 x 85.5 cm, Gemäldegalerie Alte Meister, Staatliche Kunstsammlungen, Dresden, Germany. Wikimedia Commons. I believe that Antonello’s Saint Sebastian is probably the earliest of this group. Although it is a highly accomplished painting which would stand in good company of many of the better paintings of the southern Renaissance, his modelling of the saint’s face is relatively simple, and the hair quite plain. 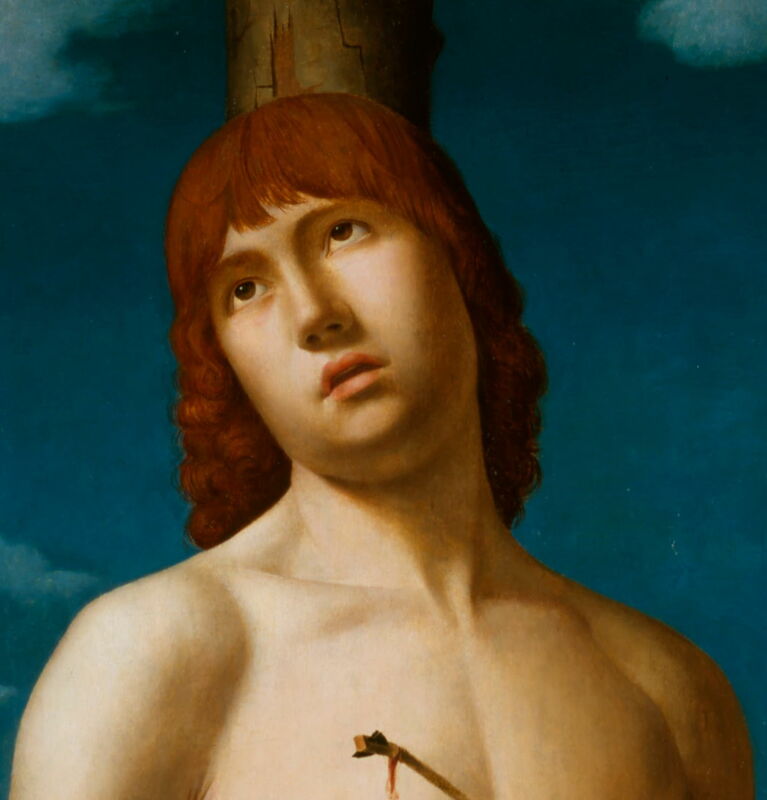 Antonello da Messina (c 1430–1479), Saint Sebastian (detail) (c 1478-9), oil on wood panel transferred to canvas, 171 x 85.5 cm, Gemäldegalerie Alte Meister, Staatliche Kunstsammlungen, Dresden, Germany. Wikimedia Commons. 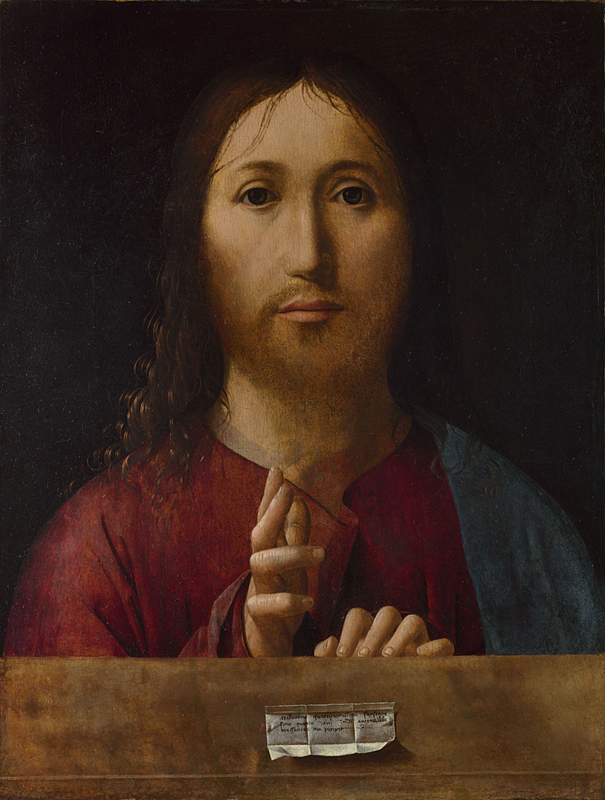 His Christ Blessing (Salvator Mundi) shows further sophistication in the modelling of the face and rendering of the hair. It also has a cryptic reference to the date in the scroll at the foot, which some have claimed date it to 1465, but it might in fact be ten years later. Paint analysis shows that the dominant drying oil used in this work was walnut oil, rather than linseed. Antonello da Messina (c 1430–1479), Fragments of San Cassiano Altarpiece (Madonna with Saints Nicholas of Bari, Anastasia (? ), Ursula, Dominic and Helen) (c 1475-1476), oil on poplar panel, centre panel 115 × 63 cm, left wing 55.5 × 35 cm, right wing 56.8 × 35.6 cm, Kunsthistorisches Museum, Vienna, Austria. Wikimedia Commons. We have reliable documentary evidence that his San Cassiano Altarpiece (Madonna with Saints Nicholas of Bari, Anastasia (? ), Ursula, Dominic and Helen) was completed when he was in Venice, in 1476. Although the fragments are incomplete, it shows strong influence from the northern Renaissance. Antonello da Messina (c 1430–1479), Fragments of San Cassiano Altarpiece (Madonna with Saints Nicholas of Bari, Anastasia (? ), Ursula, Dominic and Helen) (detail) (c 1475-1476), oil on poplar panel, centre panel 115 × 63 cm, left wing 55.5 × 35 cm, right wing 56.8 × 35.6 cm, Kunsthistorisches Museum, Vienna, Austria. Wikimedia Commons. 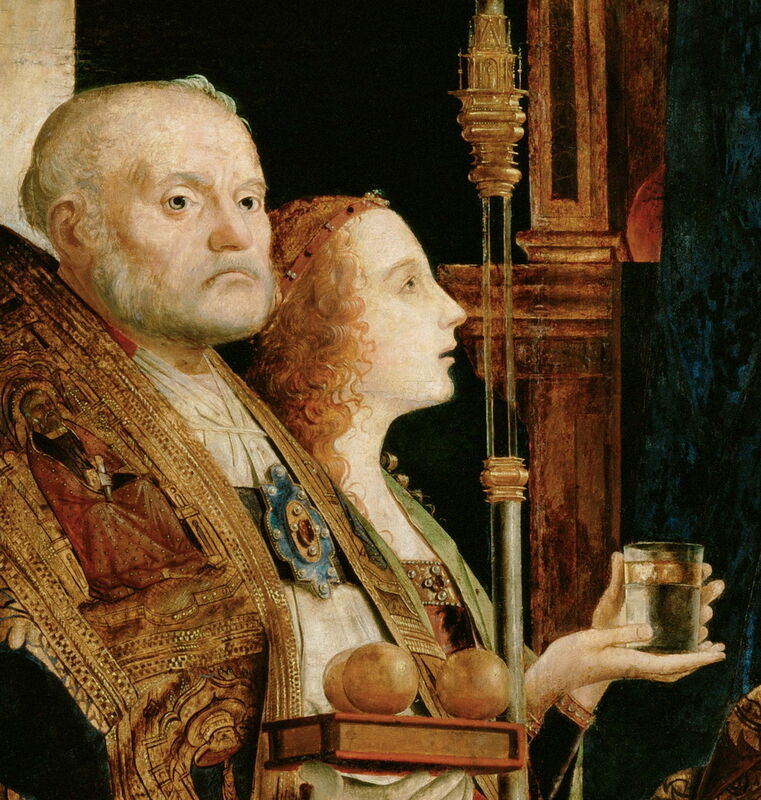 In addition to its elaborate details of fabrics and clothing, Antonello has embarked on some of the Flemish exercises in depicting optical test pieces, such as a glass of water, and the fine glass rods just to the right of the female saint’s face. This is strongly reminiscent of Jan van Eyck’s optical exercises, such as in his The Arnolfini Portrait (1434). 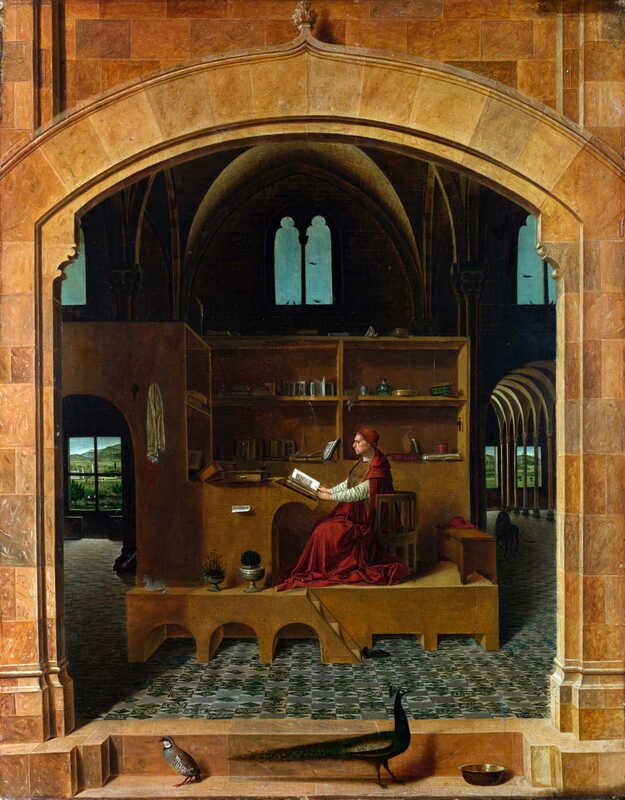 Antonello da Messina (c 1430–1479), Saint Jerome in his Study (c 1475), oil on lime wood, 45.7 x 36.2 cm, The National Gallery, London. Wikimedia Commons. Antonello’s Saint Jerome in his Study is another late work which is heavily influenced by the northern European paintings which he must have seen, and was painted to their same high standard. However, rather than using linseed oil as its binder, analysis has shown that it too used walnut oil. This flies in the face of what is usually written about drying oil usage in Italy at this time: walnut oil is said to have been preferred for lighter pigments, because it discolours less on drying than linseed oil. In this painting, that reason for using walnut oil does not appear to be convincing. Antonello da Messina (c 1430–1479), Saint Jerome in his Study (detail) (c 1475), oil on lime wood, 45.7 x 36.2 cm, The National Gallery, London. Wikimedia Commons. Even the fine structures of the landscape background are depicted in perfect detail. Such landscape vignettes are common in northern European paintings of the 1400s. His Portrait of a Man is another sophisticated painting which demonstrates his mastery of the new medium, and was probably one of his later works. Antonello da Messina (c 1430–1479), Christ at the Column (c 1476), oil on panel, 30 x 21 cm, Musée du Louvre, Paris. Wikimedia Commons. 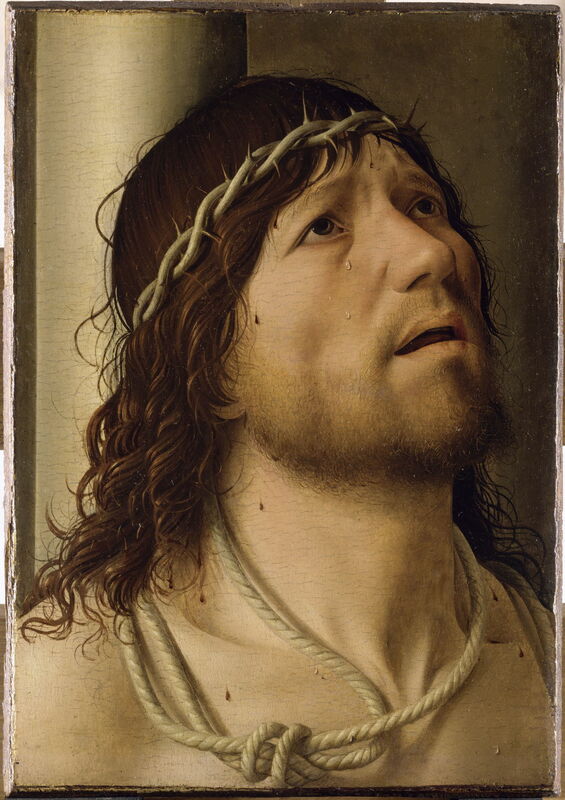 But for me, the finest and most moving of his works in oils must be Christ at the Column, showing Christ crowned with thorns, his face cast up to heaven in his suffering. 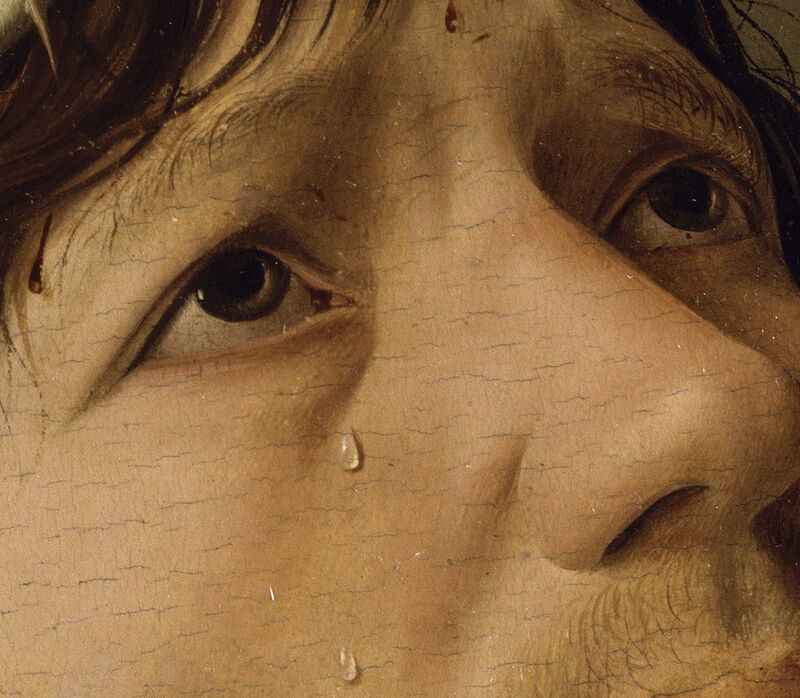 Antonello shows his skill in manipulating oil paint, right down to the two small tears on Christ’s cheek, and the congealed droplet of blood just below the hairline. There is no evidence that Antonello, or any of the other earlybird painters in oil in Italy, varied much from the materials and methods which had been brought from northern Europe, other than in their preference for walnut over linseed oil. Surprisingly, with Venice the trade centre that it was, they appear to have used predominantly pine rather than more exotic resins too. As you can see from the detail views, Antonello’s paint layers are very smooth in finish, do not show any brushstrokes or impasto, and generally have a minimum of only fine cracks. Maroger and Redelius, though, claim that Antonello’s principal innovation was the widespread use of “lead-paste medium”, prepared by cooking linseed or walnut oil with large amounts of litharge (lead oxide). This appears to be largely based on an account of what was termed oglio cotto by JFL Mérimée (1757-1836), and unsupported by any evidence from Antonello’s paintings. By this time, others were switching to oils too, and honing their skills with the new medium. Piero della Francesca probably started using oils with tempera by about 1454, and his Saint Michael (1454-1473), from the high altarpiece of Sant’ Agostino in Sansepolero, was probably painted largely using walnut oil as a binder. These were not entirely successful, it would seem, with the appearance of some wrinkling and drying defects in the paint surfaces. Some of Cosimo Tura’s paintings from the late 1450s also appear to mix oils with tempera layers. Within a decade of Antonello’s death, also in Venice, the Bellinis were taking oil painting even further. 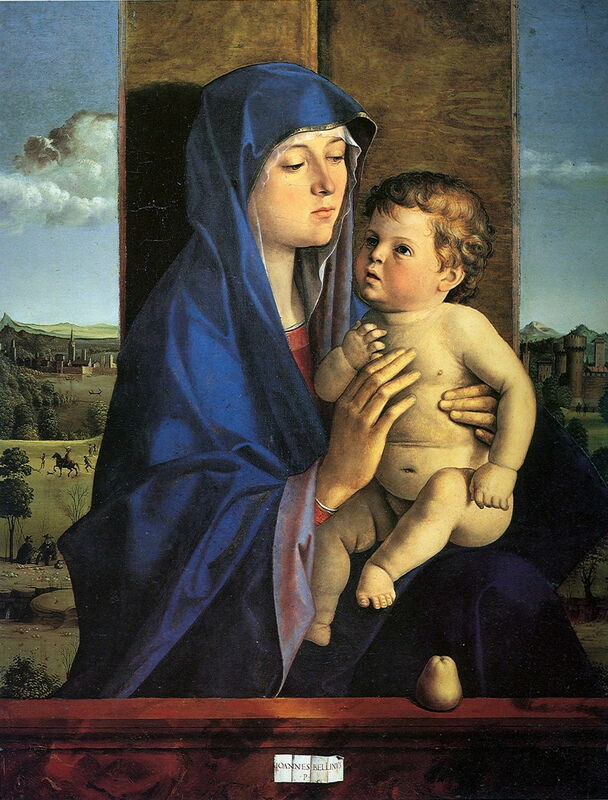 Giovanni Bellini (c 1430–1516), Madonna with a Pear (1488), oil on panel, 83 × 66 cm, Accademia Carrara, Bergamo, Italy. Wikimedia Commons. Giovanni Bellini’s Madonna with a Pear (1488) shows how far Italian art had come in less than forty years. His San Giobbe Altarpiece (c 1487) couples the southern revolution of perspective projection – with its reference to Masaccio’s Holy Trinity (c 1427) in Florence – with the northern revolution in oil painting. Everything was in place for the height of the Renaissance. Antonello da Messina on Wikipedia. Niccolò Antonio Colantonio on Wikipedia. Dunkerton J et al. (1991) Giotto to Dürer, Early Renaissance Painting in the National Gallery, National Gallery & Yale UP. ISBN 978 0 300 05082 0. Skorupa T (2015) Antonello da Messina and His Workshop, The Master’s Legacy, Logos. ISBN 978 3 8325 3929 0. Posted in General, Painting, Technology and tagged Antonello, Bellini, Colantonio, history of painting, Maroger, oil paint, oil painting, painting, Piero della Francesca, Redelius, renaissance, Tura, van Eyck. Bookmark the permalink.